Last week, our very own Dr. Arianne Hinds received the prestigious 2017 WICT Rocky Mountain Woman in Technology Award. 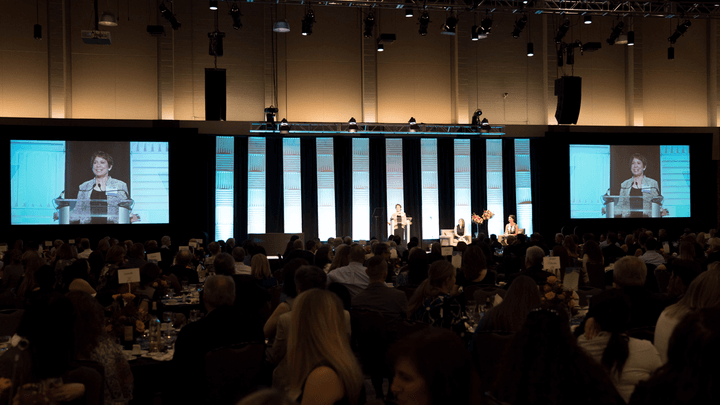 WICT is a national organization for Women in Cable Telecommunications, and the Rocky Mountain chapter is one of the largest and most influential of all the chapters. CableLabs has been a strong supporter of WICT for many years and is thrilled for Arianne to receive this recognition. Dr. Arianne Hinds has over 25 years in the industry in the areas of image and video compression, including MPEG and JPEG. She currently serves as the head of the United States delegation to MPEG, as the Chairperson of the L3.1 Committee for United States MPEG Development Activity for the InterNational Committee for Information Technology Standards. She is the lead inventor on several image and video compression patents, including four patents that are essential to a MPEG video standard (ISO/IEC 23002-2), for her work on fixed-point implementations of the Discrete Cosine Transform and Inverse Discrete Cosine Transform (DCT/IDCT); the same DCT/IDCT topic also served as the basis for her Ph.D. thesis. She has 17 patents issued so far and several more pending. In her current role in the Office of the CTO, she is responsible for developing the strategy for CableLabs’ participation in 32 standards development organizations, industry consortia, and other technical fora. The resulting strategy is then shared with CableLabs members to facilitate alignment on key strategic goals: drive scale of technologies important to cable, create interoperable solutions that drive vendor diversity, improve the ability for our cable members to compete, and assess new technologies relevant to the cable business. Arianne’s background as a video compression subject matter expert and her ability to drive consensus in challenging situations has profoundly increased the impact that the cable industry has on many video-related specifications, including MPEG and SCTE standards. As an example, she has been successful in driving cable-friendly requirements into adaptive bitrate specifications such as MPEG DASH and HEVC. The WICT touchstones of leadership are great guidelines for everyone to follow. Click here to read about these touchstones in detail. Arianne received her award along with a number of other deserving industry colleagues at the WICT Rocky Mountain Walk of Fame gala, where over 680 industry professionals gathered to honor these inspiring women. CableLabs congratulates Arianne and all the 2017 WICT Rocky Mountain Walk of Fame honorees! To find out more about Arianne's research read her blog post The Search for Royalty-Free Video Codec. You can also read some of her many publications by clicking here.